The 33-year-old carded a three under par 69 in the final round of the ISPS HANDA Perth International to finish fourth at the European Tour and PGA Tour of Australasia co-sanctioned event. Hendry, who carded a seven under par 65 in round one to claim the lead at the Lake Karrinyup Country Club, played solidly throughout the week to finish seven shots back from the champion American Bo Van Pelt. Hendry had rounds of 65, 73, 72 and 69 for a nine under par 279 total to earn $123,000 (NZD) for his biggest pay cheque of the year surpassing the $81,000 he earned when he won the NZ PGA Pro-Am. He opened with a birdie at the first but then made double bogey on three and bogey on four to lose momentum early in his round. But he rallied in fine fashion to make four birdies in the final five holes of the front nine to make the turn in two under par 34. Hendry added further birdies at the 14th and 17th and then dropped a shot at the 18th to sign for a 69. The former Auckland cricketer began the season the perfect way when he claimed the New Zealand PGA Pro-Am Championship at The Hills but, by his own admission, has been quiet since on the OneAsia Tour until recording a tie for seventh in China last week. It is his best result on the European Tour easily surpassing his tie for 43rd place at the China Open in 2011. Wellington professional Mark Brown had an even par 72 in the final round to finish in a share of 15th place. The former European Tour Champion had rounds of 71, 69, 72 and 72 for a four under par 284 total. Brown, who won the Carrus Open recently on the Charles Tour, claimed $35,000 (NZD) to continue his good season. He is currently ninth on the OneAsia Order of Merit..
Taihape professional Hamish Robertson had rounds of 76, 69, 76 and 73 for a six over par 294 total to finish tied 56th and take home $7400. The other Kiwis Mahal Pearce, Ben Campbell, Gareth Paddison, Brad Shilton, Josh Geary, Pieter Zwart and Michael Long all missed the cut. Meantime over in the States Danny Lee looks to be in a losing battle in his fight for his card on the PGA Tour. The New Zealand No.1 has finished tied 32nd at the McGladrey Classic in Georgia after carding a one under par 69 in the final round at the Seaside Course on Sea Island. Lee had rounds of 65, 70, 69 and 69 for a seven under par 273 total to finish nine shots back from American Tommy Gainey who came home with an incredible 10 under par 60 to win his first PGA Tour title. The Rotorua professional climbs four places to 164 on the money list and needs to climb inside the top 125 players at the final event of the Fall Series to keep his PGA Tour card for the 2013 season. Hamilton professional David Smail has carded an even par 71 in the final round of the Bridgestone Open to finish tied 21st on the Japan Golf Tour. The 42-year-old pro had rounds of 69, 71, 70 and 71 for a three under par 281 total to claim $22,000 and improve his position by two places on the Order of Merit to 53rd. Smail, who has played for 15th consecutive years on the Japan Tour, needs to finish inside the top 70 players to secure his card for the 16th straight season. Manawatu professional Tim Wilkinson has finished in a share of 41st place at the Winn-Dixie Jacksonville Open in Florida on the web.com Tour. Wilkinson had rounds of 68, 73, 71 and 72 for a four over par 284 total, 14 shots back from Americans Russell Henley and B.J Staten. The left handed pro, who is 54th on the web.com money list, needs to climb inside the top 25 to return to the PGA Tour. Fellow Manawatu pro Grant Waite, who made his first made cut for the year, finished tied 65th after a six over par 76. 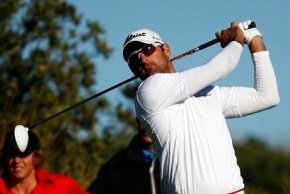 Auckland professional Ryan Fox has missed out at the First Stage of PGA Tour qualifying in Nevada. The son of All Black great Grant Fox had rounds of 71, 72, 71 and 71 to finish tied 28th at the Dayton Valley Golf Club for a three under par total to miss out on the qualifying mark by two shots. The 25-year-old, who has won three titles in his rookie year as a professional and currently leads the NZPGA Order of Merit, needed to finish inside the top 19 and ties to proceed to the second stage. The big-hitter rued his finishes to his first two rounds. He dropped six shots in closing out his opening two rounds which proved the difference. Fox birdied the last today but it was too little too late after costly bogeys on 13 and 16. He will now return to New Zealand for the BMW NZ Open where he’ll look to add to his fine performance at the NZ PGA Pro-am at The Hills where he finished tied fourth.